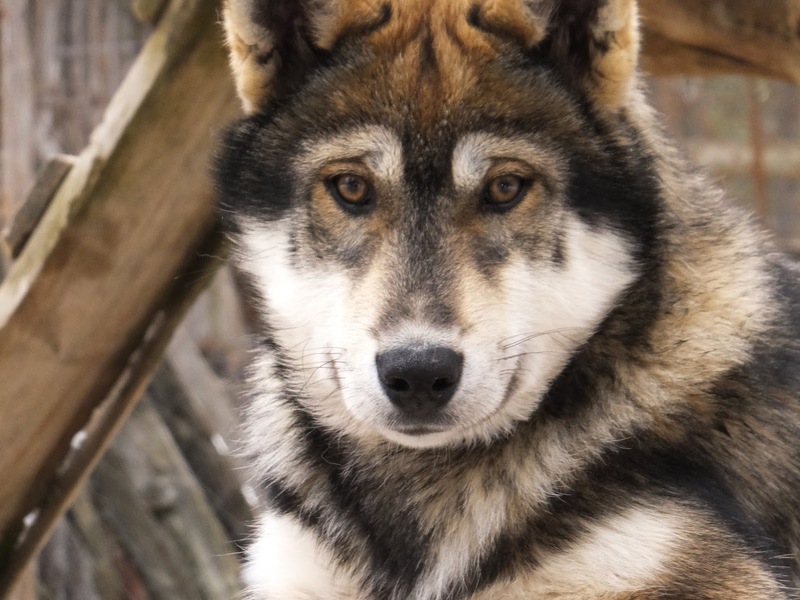 One of the huskies we met at the husky park today. 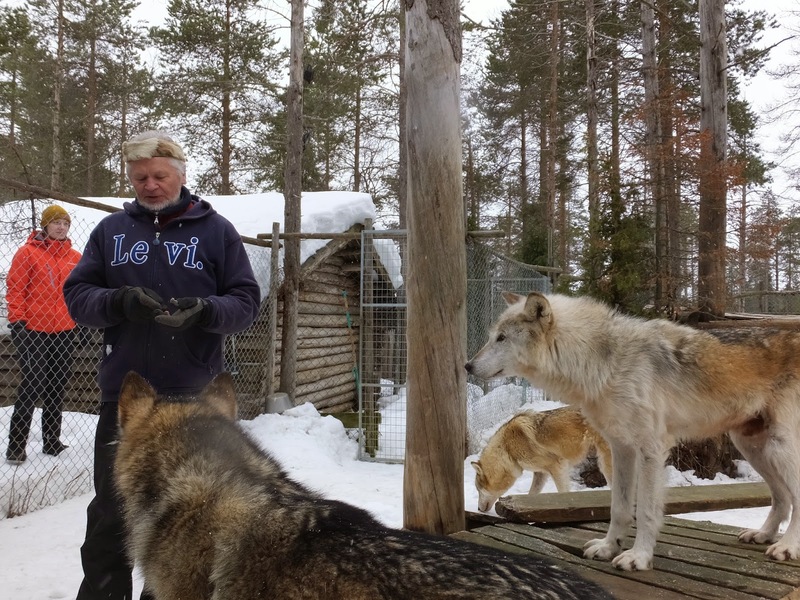 This morning we had pre-booked a visit to Levi Husky Park owned and run by Reijo Jääskeläinen, who you can read about here. 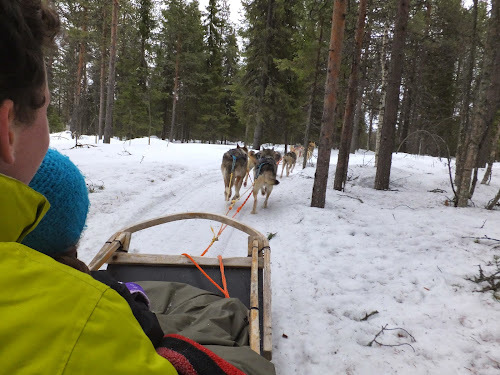 We arrived at the Husky Park (about 6 miles from Levi) after being picked up at the Levi Tourist Centre by minibus, along with a few other small groups. 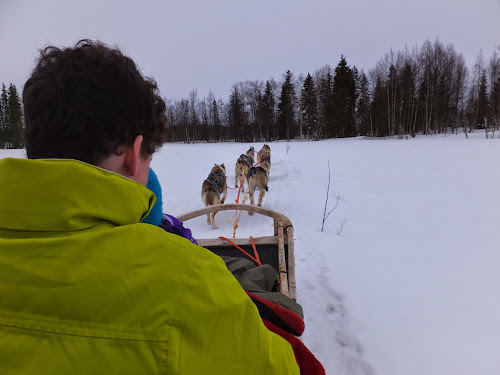 There, we were the first group to experience a sleigh ride pulled by 8 huskies, who were obviously keen to get going as they barked and leapt enthusiastically before we got started! The ride took us through forest and onto a nearby frozen lake where we sped across with the huskies pulling strongly yet obeying all the commands of the musher who was standing behind us at the back of the sleigh. I videod the ride, and although Sandy and Olivia were at the front and had their backs to us, it was obvious they were having the time of their lives. And so were Anna and me too! 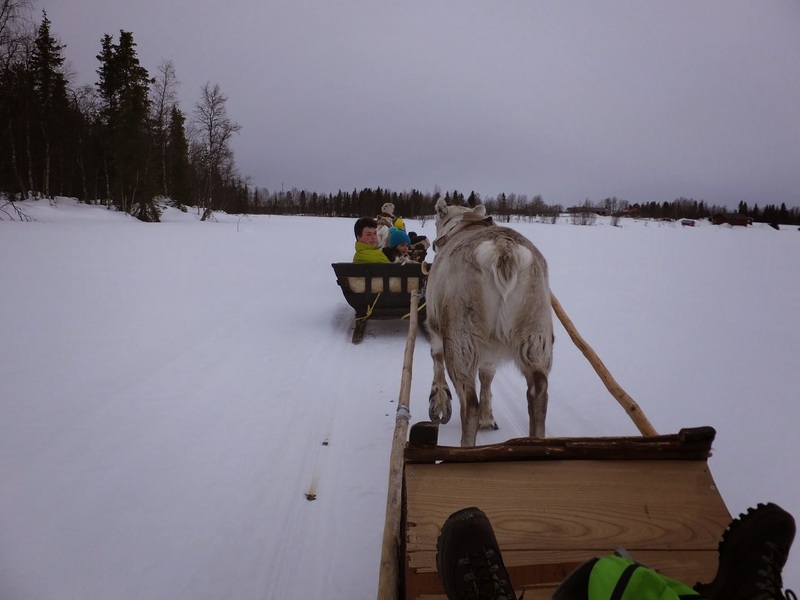 The sleigh was surprisingly comfortable and although we were travelling quite quickly over some uneven ground in the forest, it wasn't at all unpleasant. In fact, it was brilliant! Racing back over the frozen lake. They don't slow down in the forest either! 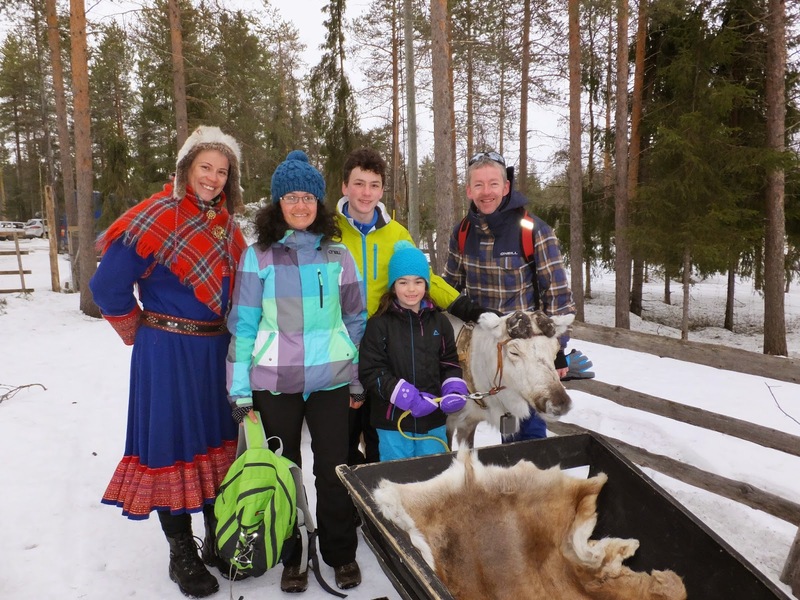 Back at the park, other groups were then led out on the sleigh and we then were shown to where the reindeer rides were to take place. 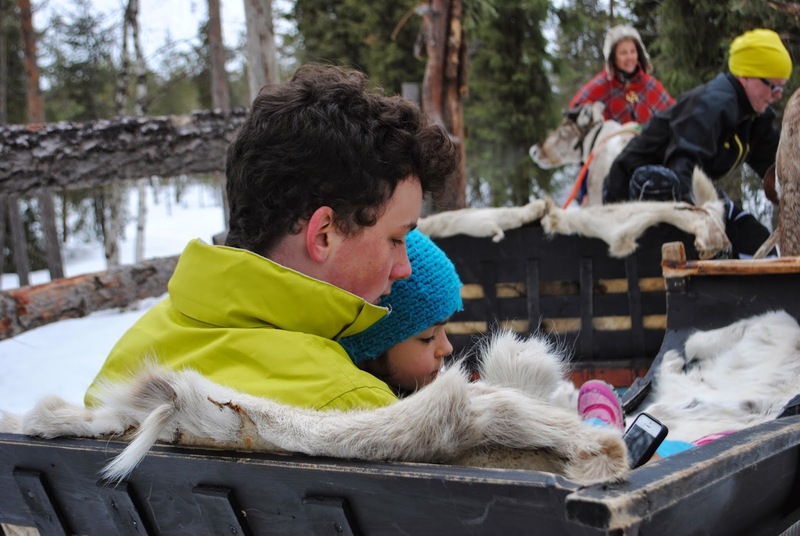 A Saami woman introduced herself and showed us how to sit on this sleigh, and then we were off again, for a more sedate ride through the forest and onto the lake. Getting ready for the reindeer ride. On the lake with the reindeer. 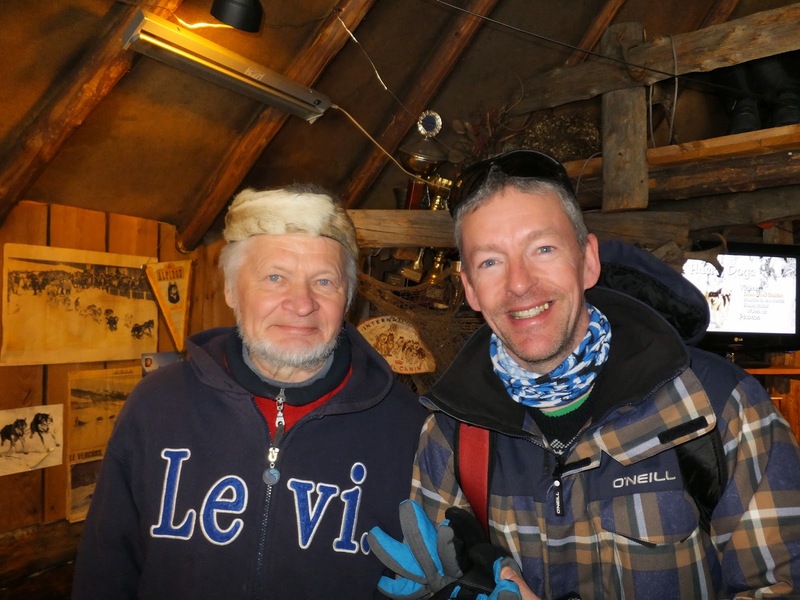 Once we were back for the second time, we took lots of photos and were shown to a warm kota (a Lappish teepee) where inside was a fire, small shop and cafe area and seats where we sat and ate hot sausages and biscuits and had coffee and hot juice. As all the other groups joined us, Reijo told us about his 60 huskies and wolves, and how they have starred in films and commercials, and how some have taken part in 1000 mile races in Alaska. A truly fascinating set of tales! Refreshment time inside the kota. 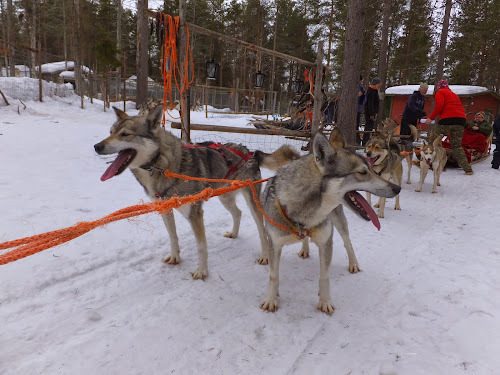 We were then shown around the park and met many of the dogs, some pure huskies, some part husky, part wolf and some 100% wolves, all of whom were remarkably gentle, friendly and extremely well trained. 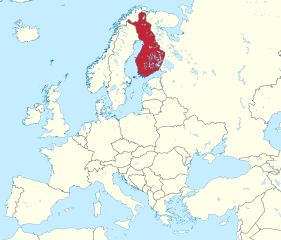 Anything their owner asked them to do, they did instantly, including one husky called Paavor (Pavorotti) which sang and howled as Reijo made "music" by tapping a saw with a metal instrument! Amazing! 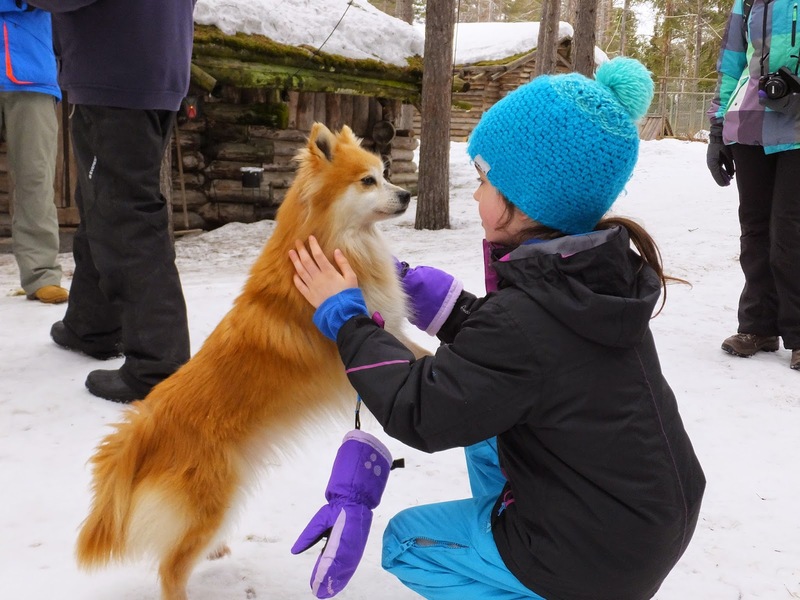 Surprise surprise - Olivia now wants a Finnish Spitz! 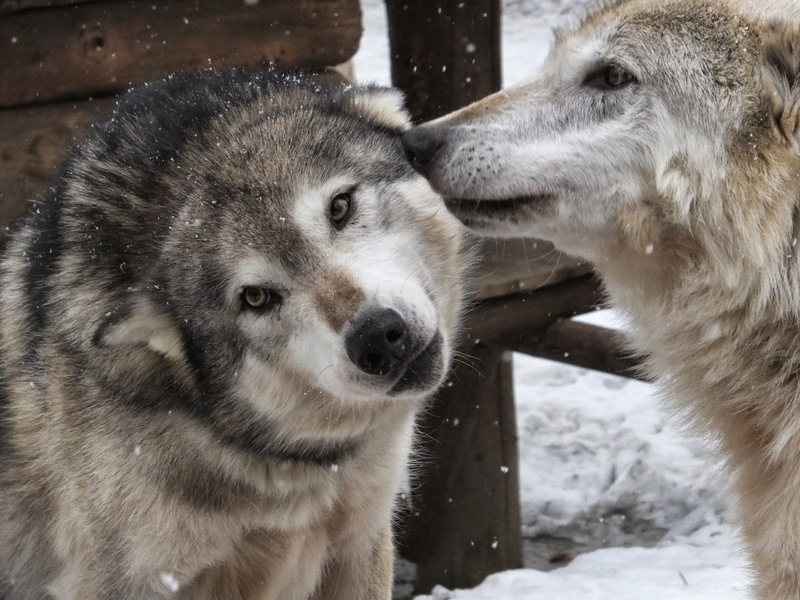 It was interesting to observe the behaviour of the much larger wolves, who obeyed all Reijo's commands but were more wary of him when he touched them, than the huskies were. 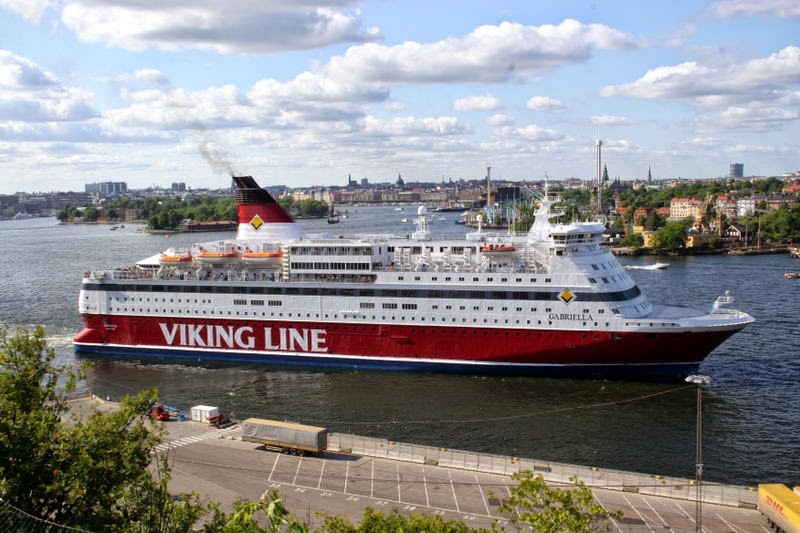 After two and a half hours, this fantastic visit came to an end and we were transported back to town where we had lunch at home. It would be fair to say we all thought this morning was a real highlight of our brilliant week. Anna zooming down in the snow. 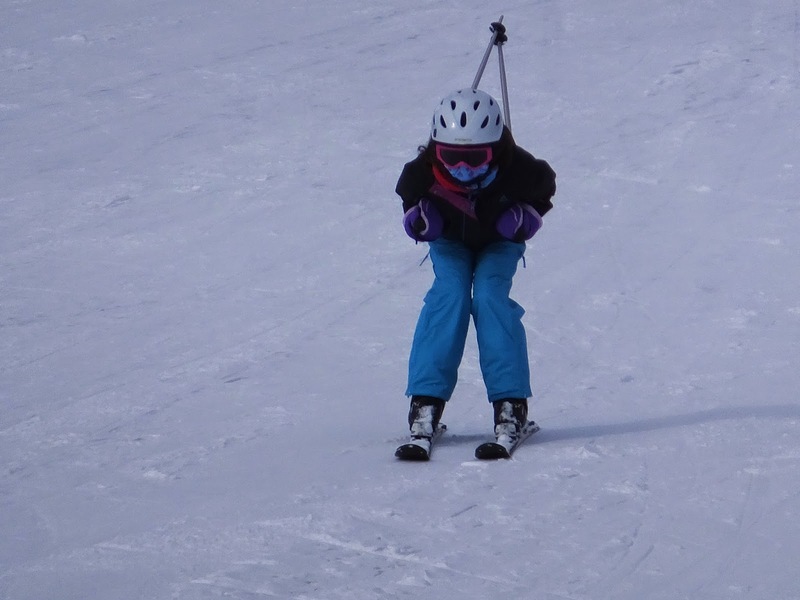 Olivia getting down into the tuck position. 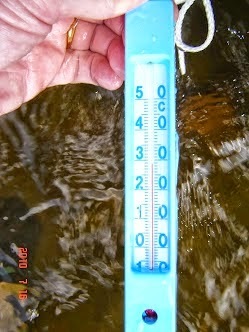 This is one of them, taken from the same position, but with the camera on full zoom. Pretty impressive. Also taken from the same spot, looking south. At the Husky Park, it had begun to snow gently, then harder, and by the time we had finished lunch at home, it was a complete whiteout and snowing very heavily. 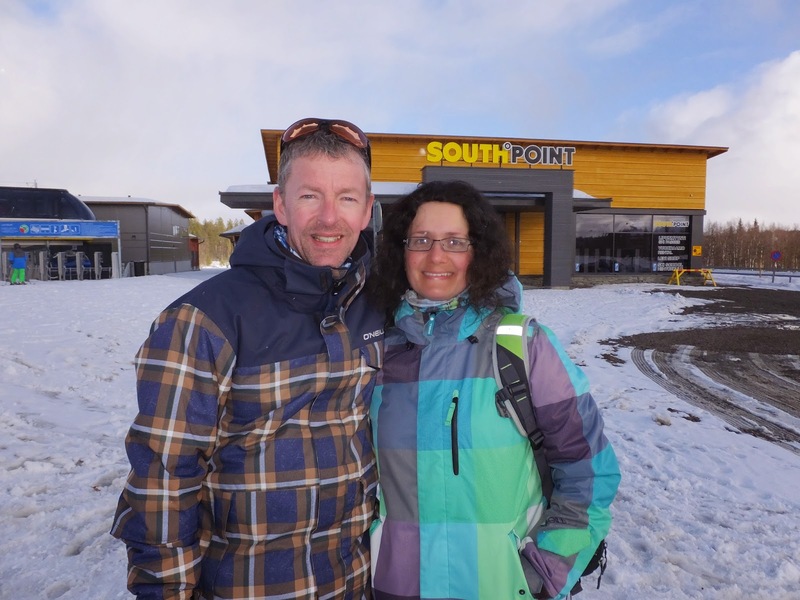 We debated where we would actually ski or not, but decided we'd go and get our equipment and ski for a while to see how things went. 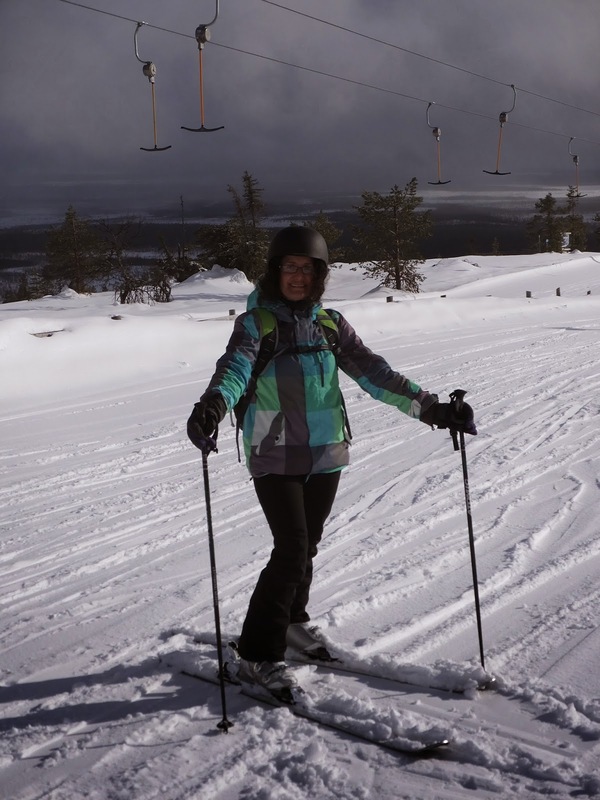 The first runs were hard going, with snow stinging even the tiny parts of our faces that were exposed, but then, the clouds seemed to lift quite quickly and suddenly we were skiing in the most gorgeous sunshine again. 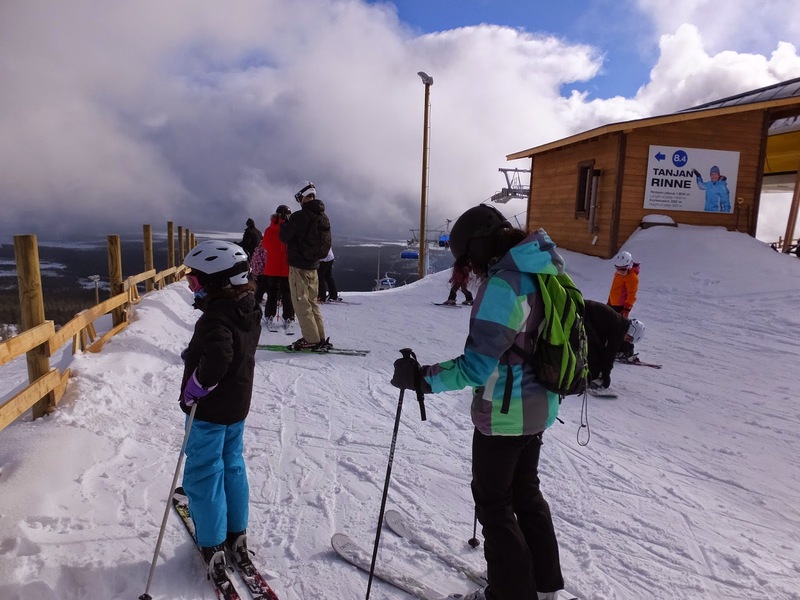 Around 5 - 10cms of fresh powder had fallen and the best thing of all was that there were hardly any people still on the slopes, as most had obviously decided to head home early. 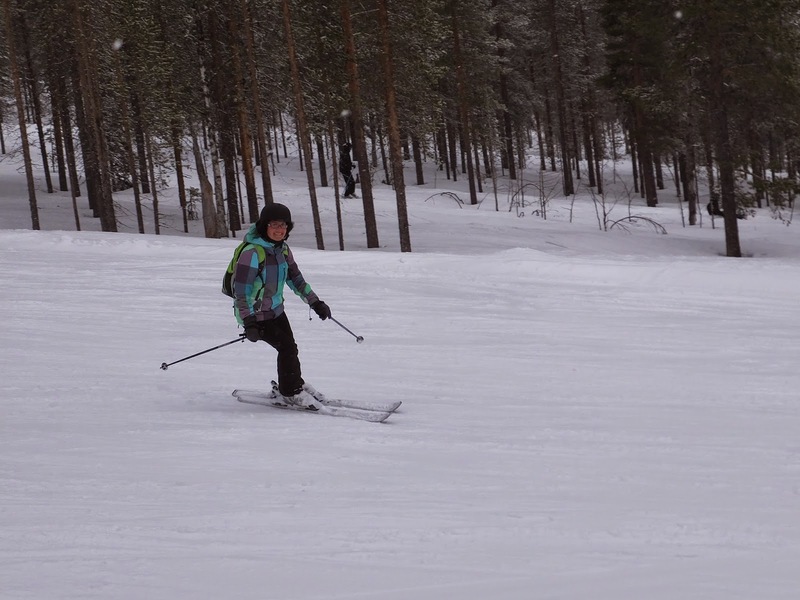 We continued to ski until nearly 5.30pm, when we reluctantly headed home. 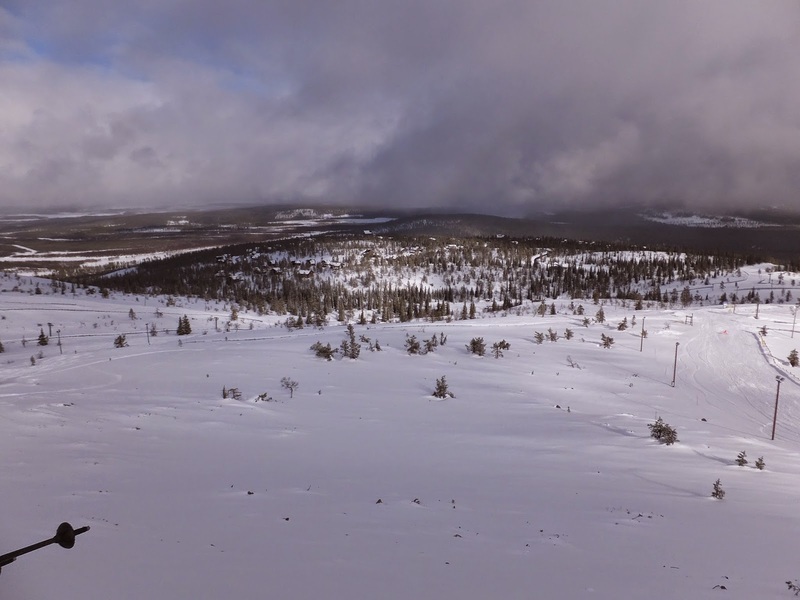 Drag racing on the front slopes on snowmobiles! At the front slopes though, as we returned our equipment, we saw loads of people congregated on the slope about Zero Point, and heard loud and very high revving engines. 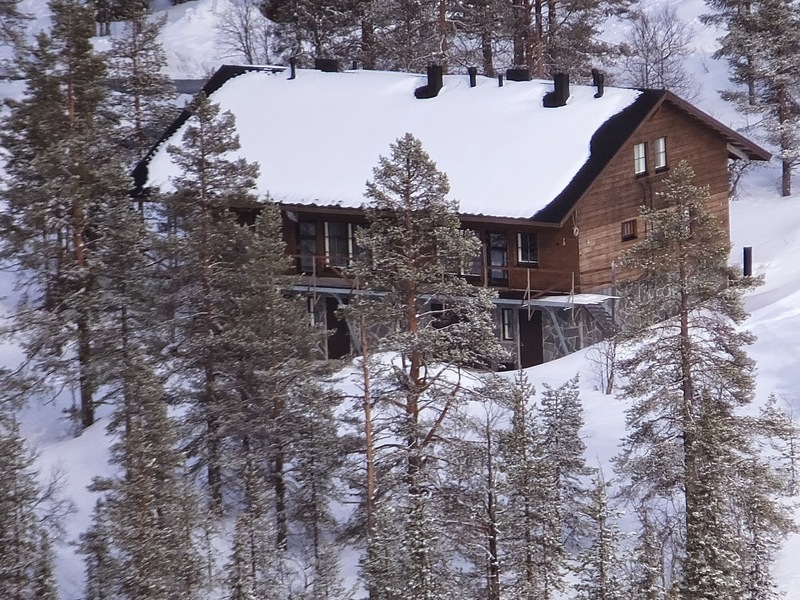 It soon became clear that there was a snowmobile racing competition on, with pairs of snowmobiles racing at breakneck speed up the front slopes, with several almost flipping over as they accelerated fiercely up the hill! 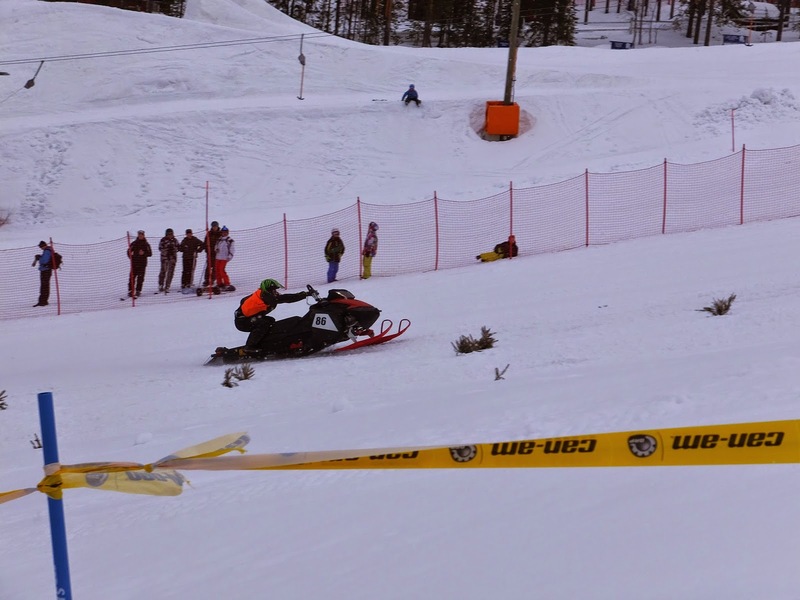 It's the first time I have seen drag-racing skidoos and it was pretty enthralling stuff! 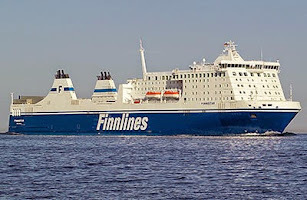 Finns certainly go for high-octane excitement! 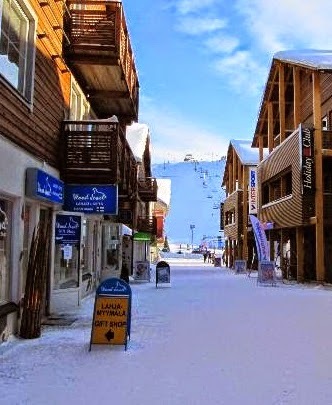 Tomorrow is Saturday, our last full day of skiing, and it's going to be cold and frosty tonight, with great sunny weather forecast all day for the slopes. We can't wait!